Football Manager 2019 Mobile ($8.99) and Football Manager 2019 Touch ($19.99) were announced to release alongside the PC version of the game a while ago. They’ve both even been up for preorder on iOS and if you’ve been itching for some simulation action on the go, your wait is now over. 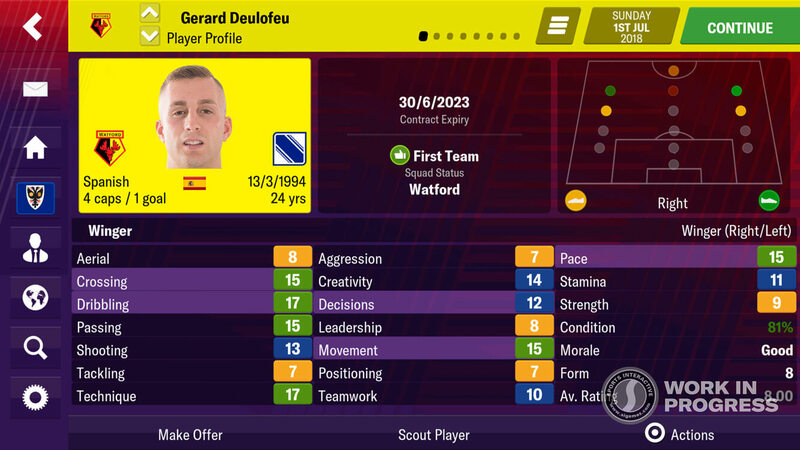 Read our thoughts on Football Manager 2018 Touchfor iPad here. It was pretty great so expectations are pretty high for the 2019 entries. If you’re unaware of the differences, Touch is a streamlined version of the main Football Manager experience for tablets and PC. The Touch version of Football Manager 2018 even made it to Nintendo Switch. While the Touch version for 2019 is set to release on Switch, we don’t have a date yet. If you have an iPad, this is the version to get. Football Manager 2019 Mobile is tuned down compared to touch since it has to work on much smaller screens as well as tablets. If you want to play on your phone, this is the version to get. Both have in app purchases for extra content. Check out our forum threads for Football Manager 2019 Touch here (the iPad version) and for Football Manager 2019 Mobile here. Touch costs $19.99 while Mobile costs $8.99 if you’re considering picking them up. Early impressions are looking good.